4/5 One of the best daycare school in Gurgaon. My son has been there for 2 years and we observed significant improvements in his body language and confidence level. This school first reviewed on 10 Oct 2017 at SchoolWiser. The overall experience with Bubbles n Blossoms Daycare & Enrichment Centre, Sector 49 based on the ratings left by users so far seems to be excellent but the sample size of the ratings is insignificant. This school seems to perform exceptionally well at Academic Rigour parameter. It also performs well on Teacher's Competence, Variety & Classrooms. Though parents may seem to have some reservation over Instructor’s Competence. Checkout detailed ratings and reviews below for reference but do exercise your best judgement. Established in 2015, Bubbles n Blossoms also known as BnB is an initiative by AIIMS, Wharton & University of Michigan Alumni. At BnB the main ethos is to provide the highest quality of childcare with a Playway Interactive Approach following the fundamentals of 3E - Enquire, Explore, Experiment. The nutritious in-house meals, immaculate environment and very caring teachers ensure personalised attention to the kids helping the children to foster their intellectual and social development. Bubbles n Blossoms has tie-ups with Kunskapsskolan, Scottish High International School, Basant Valley International School, GEMS Modern Academy for onward admission. A detailed fee structure & complete breakup for Bubbles n Blossoms Daycare & Enrichment Centre, Sector 49 is provided below for reference. The objective of the fees details below is to provide an economic reference point for parents to understand approximate expense for this preschool and evaluate affordability based on their current circumstances and for the long term. 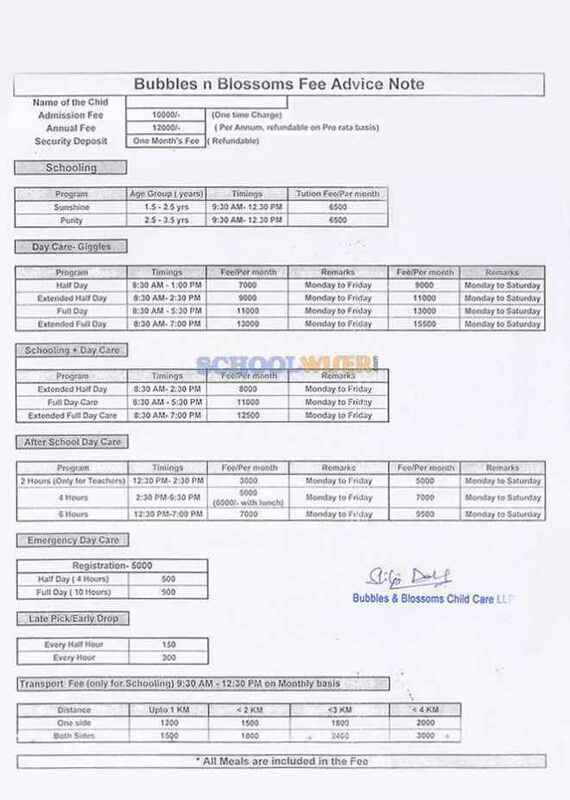 For parents admitting their children in admission session 2016-2017 at The school the total preschool fees for the first year including all admission related charges for KG but excluding transport fees shall be around Rs.1,06,500. This includes total One-Time Admission related Charges including Refundable Security of Rs.16,500. For parents continuing in the school from previous years, the effective annual fees is around Rs.90,000 i.e. approx. Rs.7,500 per month or Rs.22,500 per quarter without transport fees.